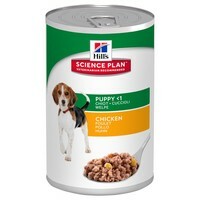 Hills Science Plan Healthy Development Wet Food for Puppies has been developed to provide all of the essential nutrients growing puppies need during the early stages of their life. Made with only high-quality ingredients including clinically proven antioxidants to support and promote a healthy immune system, Hills Puppy Food tastes great, is easy to digest and gentle on your puppy’s stomach. Hills Puppy Food also contains Omega-3 and optimal mineral levels for mobility, and to promote healthy skin and a shiny coat. I have a Hungarian Vizla, she is now 8 months old, and has been on Hills Puppy food since she was 12 weeks old, after having a very bad bout of diahorrea and she was given Hills by the vet. It is brilliant, she is growing, fit and healthy - expensive but well worth the money. This is the best puppy food I have ever used. I have a Border Collie pup that developed a sensitive tummy I put him onto this food with the same biscuits mixed and he has never been healtier, people always tell me how beautiful his coat is which to me indicates a healthy dog. will definatley use the adult food when he is ready.